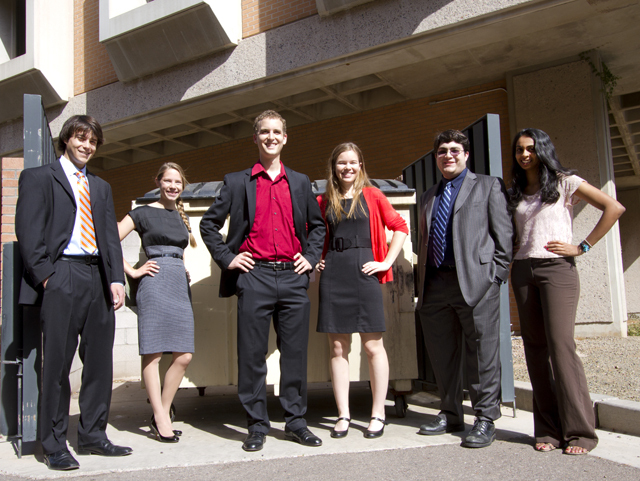 A team of former and current Arizona State University engineering, marketing and sustainability students developing a venture to combat hunger are in the finals of a national competition focusing on entrepreneurship and sustainable solutions to social challenges. Team FlashFood will compete in the Yum! Global Sustainability Challenge, November 7-9, in Louisville, Ken., against teams from the University of California-Berkeley, the University of Louisville, the University of South Florida, the University of Southern California and American University in Washington, D.C. They will be vying for a grand-prize $20,000 cash prize. Yum! is one of the world’s largest restaurant companies, with more than 36,000 restaurants under its operations, including the KFC, Pizza Hut and Taco Bell chains. The company is a founding partner of the Food Donation Connection, a nonprofit food recovery program. FlashFood has been developing a mobile-phone application to connect a food recovery and distribution network. The idea is to collect leftover and excess food from restaurants, catering services and banquet halls and deliver it to various community and neighborhood locations from where it could be distributed to people in need. The idea for the venture won FlashFood the U.S. Microsoft Imagine Cup Finals in April, earning the team a trip to the Imagine Cup Worldwide finals in Australia in July. FlashFood’s performance in the international competition led to its selection as one of the teams eligible to receive an Imagine Cup grants to support its project. Five teams out of the original 40 will share equal amounts from $350,000 yet to be awarded by Microsoft. Over three days the teams will participate in presentations and question-and-answer sessions about their ventures, leading to a final showdown between the top two teams. The winner is decided based on a 20-page business plan and a 15- minute presentation to judges. Each team will be required to present “the fine details to implement its idea, to have a revenue plan and to explain how its idea will be sustainable,” Lehnhardt says. FlashFood will be presenting to the founders of Food Donation Connection, whose leaders have mentored the team as it has been developing its project. Preparing for the competition has pushed FlashFood members to devise more specific strategy for how they will take their efforts from the idea stage to a concrete action plan. “It has made us answer those questions in a very detailed way,” Lehnhardt explains. The team is currently conducting market-validation work – researching the likelihood that restaurants will be interested in joining the FlashFood network. Team members have met with representatives of several restaurants to explain their service and get feedback on ways to improve the system so that it can be appealing to donor organizations. So far, team members report, three organizations are interested in participating, and one community center has signed on to be a food drop-off point. In addition, the team is approaching the beta testing stage for the software for the FlashFood mobile-phone app.